The Pod is a disk of roasted, ground and compressed coffee, enclosed between two sheets of food-grade filter paper and sealed in a foil pouch. It comes in two sizes, 7 grams and 14 grams for 1 and 2 servings respectively. •Eliminates the need for a coffee grinder. •Eliminates the need for the knock box. •Reduces the costly maintenance of the espresso machine as a result of loose coffee grounds no longer being allowed to travel into the machine. •Eliminates brewing inconsistencies always resulting in a perfect cup of coffee. •Offers operators exact cost and inventory control. 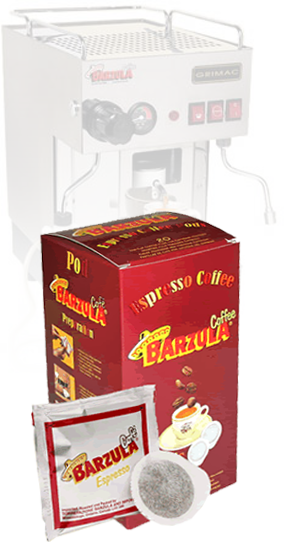 We carry a variety of Espresso Pod machines, for home, office and commercial use designed to work with the Pod.